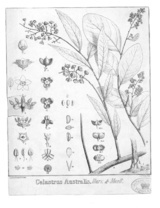 Celastrus australis Harv. & F.Muell. 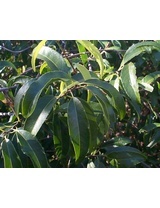 Description: Climbing dioecious shrub, ± glabrous; stems mostly grey to grey-brown, young branchlets with broad-ovate to triangular erose scales near base. 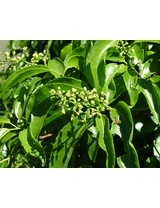 Leaves lanceolate to elliptic, often falcate towards apex, mostly 3–9 cm long, 1–4 cm wide, apex acute or acuminate, margins entire or toothed; petiole 3–15 mm long. Flowers in terminal panicles on pedicels to 2.8 mm long, yellowish green. 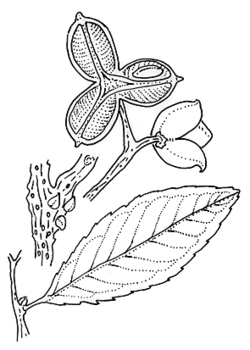 Sepals 1.5–2 mm long. Petals 1.8–3 mm long. Capsule ellipsoid to subglobose, 3–6.5 mm long, light brown, inner surface with scattered red spots; seeds 3–4 mm long, aril orange. 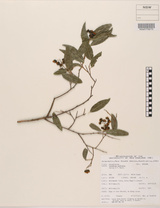 Distribution and occurrence: Widespread in warmer rainforest.